The 23-year-old’s strikingly beautiful yellow dress incorporated a myriad of things Bahamian from branches, flowers and beads to straw, butterflies and birds. His piece wowed the audience at Sapodilla Restaurant, as his model, Miss Universe New Providence, Sienna Evans, sashayed down the runway. As a Fashion Design graduate of The Bahamas Technical and Vocational Institution (BTVI), he was eligible to be one of the 15 entrants of the competition which was exclusively for BTVI students and alumni. It was a collaboration with MBO that is already reaping much exposure for the participants. “The experience was really exciting. Also, after winning, it was very humbling, knowing that what I can do can be seen worldwide,” said the 2006 graduate. This year’s theme for MBO’s pageants (Miss World Bahamas, Miss Universe Bahamas and Miss Earth Bahamas) is ‘Beauty by Nature’ and each contestant was paired with a current or former BTVI student. While there were judges to find the top model among contestants, there were also judges to find the top designs on the runway. The BTVI students and alumni were able to bring their vision to life, thanks to MBO’s partnership with Commonwealth Fabrics, which helped to donate fabrics and notions. Second place winner for the Top Designer award was Delano Marc, who was unable to attend the event as he was working. “I was texting people and calling. I found out at 11 pm that I placed second. I was telling all of my colleagues,” said the BTVI student. Delano’s piece was inspired by international recording artist Rihanna’s song, Towards the Sun. The 24-year-old said he often gets inspiration from music. The fitted dress was layered with yellow fabric, accessorized with a graphic cape which had an airbrushed tree on it, covered with a cluster of leaves. The 24-year-old’s model was Miss Universe Grand Bahama, Darronique Young. Walking away with third place was another BTVI graduate, Mrylande Julien. She broke rank by refusing to create an evening gown, but a creation that incorporated pants. It turned heads as it was a three-piece ensemble that incorporated pants, layered with a sheer skirt and bustier, in addition to being all white. It was worn by Miss Universe Paradise Island, Toria Penn. “I wanted to do something different. I guessed everyone else would do a dress,” said the 2010 BTVI graduate, who thinks outside of the box. “I saw the model and I just saw white on her. As soon as I saw her, I envisioned the pants with the skirt in white. I hope the Miss Bahamas Organization continues to do this. It was a very good incentive for students,” said the 31-year-old. The winner and runners-up of the Top Designer competition will go on to design three to four signature pieces and be paired with Miss World Bahamas, Miss Universe Bahamas or her first runner-up, Miss Earth Bahamas. Each queen will reserve one of the pieces for an international competition. Meanwhile, the head of BTVI’s fashion department, Shirley Pearson, expressed elation over the competition. “The students really deserve this. This is more motivation for the others. We’re now on the map and bigger and better things are to come for the students and BTVI. Our students can stand with any international fashion students,” she exclaimed. Senior craft instructor, Kathy Hamilton-Pinder chimed in, saying she was impressed with the students’ workmanship. “They did an excellent job for amateurs. Trineil is a great designer and full of talent. Delano learns quickly and is very determined and Myrlande, she believes in herself and has great potential. I believe this competition will boost enrolment for the fashion department, which is BTVI’s best kept secret,” said Ms. Pinder with pride. EMERGING DESIGNERS: Winners of the Miss Bahamas Organization Top Designer Award pose following the competition. 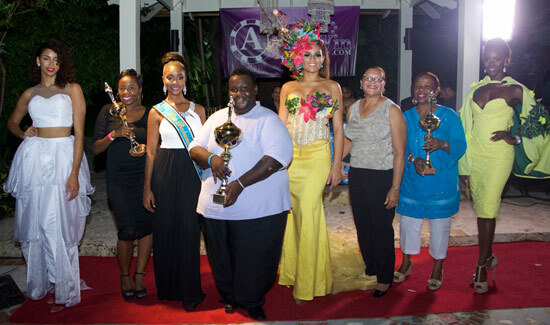 From left to right, Miss Universe Paradise Island, Toria Penn in the outfit created by third place winner Myrlande Julien; Ms. Julien; Miss Bahamas Teenager, Davette Strachan; first place winner and BTVI graduate, Trineil Hanna; Miss Universe New Providence, Sienna Evans in the winning outfit; BTVI Acting President, Dr. Iva Dahl; BTVI’s Head of Department for fashion, Shirley Pearson, holding the trophy for second place winner, Delano Marc, and Miss Universe Grand Bahama, Darronique Young in Mr. Marc’s creation. Miss Universe New Providence, Sienna Evans, sashayed down the runway in the winning outfit by BTVI 2006 graduate, Trineil Hanna. Miss Universe Grand Bahama, Darronique Young, struts for the audience during the Top Designer Award competition. The fitted gown’s designer is BTVI student Delano Marc. Miss Universe Paradise Island, Toria Penn dazzles in this three-piece ensemble created by 2010 BTVI graduate, Myrlande Julien. The creation placed third in the Top Designer Award.